We spend a lot of time talking about the intersection of reefs and the art world, and this photo is a great example of something near and dear to any reef aquarist, encrusting corals. As many people know, encrusting corals typically have very fast horizontal growth rates and demonstrate very interesting patterns and formations when left to grow on flat objects like tiles and discs. But what happens when you give the coral a head start by growing it onto an actual 3D object? This skull encrusted with Meteor Shower Cyphastrea is a great example of how to take your typical underwater decoration and make it into something entirely new. Having gone through the process a few times with Moai statues, I have to tell you that it is only for people who have great patience, but the rewards are striking in their appearance. If you decide to try your hand at this process, make sure you give the object plenty of room – having another coral sting your piece mid-growth can set you back an entire year. 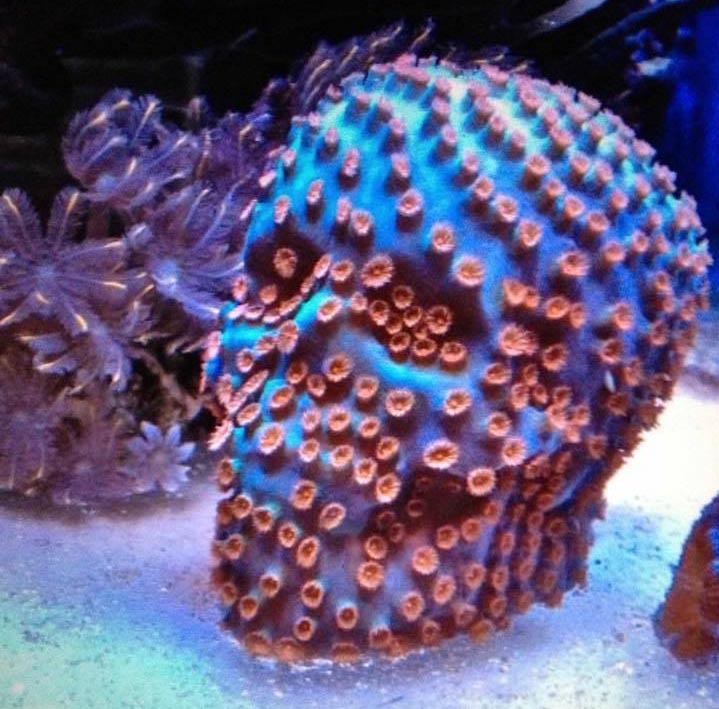 Also be sure to pick a coral that has a high growth rate or you will be waiting forever. Finally, pick a coral that does not typically plate out when it grows as this will create a shadow and prevent your piece from being completely encrusted. Have you ever done this yourself? Drop us a note in the comments and tell us how you did it!